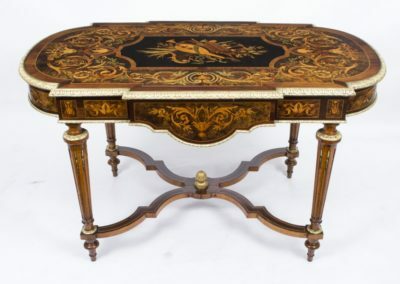 Dating from around 1850 this is a very attractive antique French Bureau Plat writing table featuring delicate and impressive decorations fashioned from a combination of Kingwood, Rosewood, Tulipwood and Purple Heart complemented by some of the finest Ormolu borders you are likely to see on a piece of furniture anywhere. 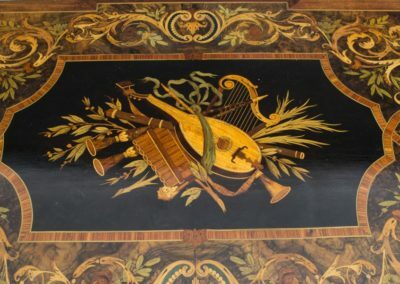 There is a central panel which comprises of a variety of inlaid musical instrument designs set in a flower filled Ebony ground. 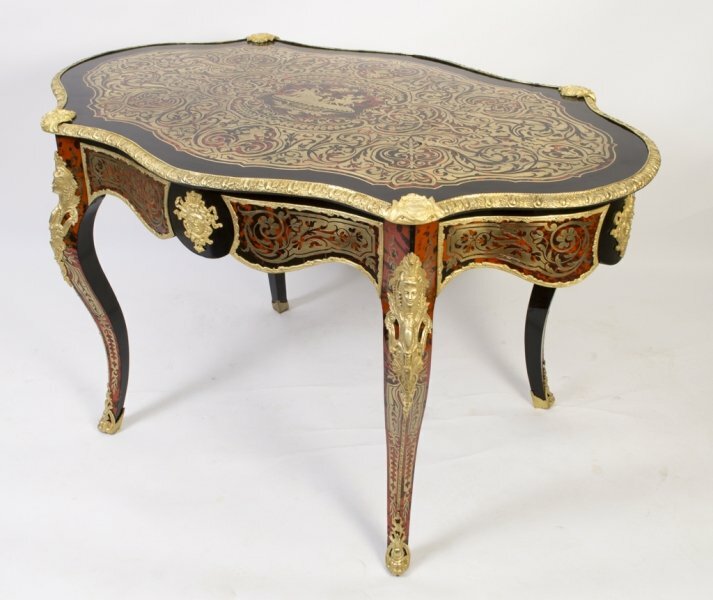 As you can see from the following image, the craftsman responsible for creating this fine table certainly didn’t cut any corners when selecting fine quality materials for this piece of work. 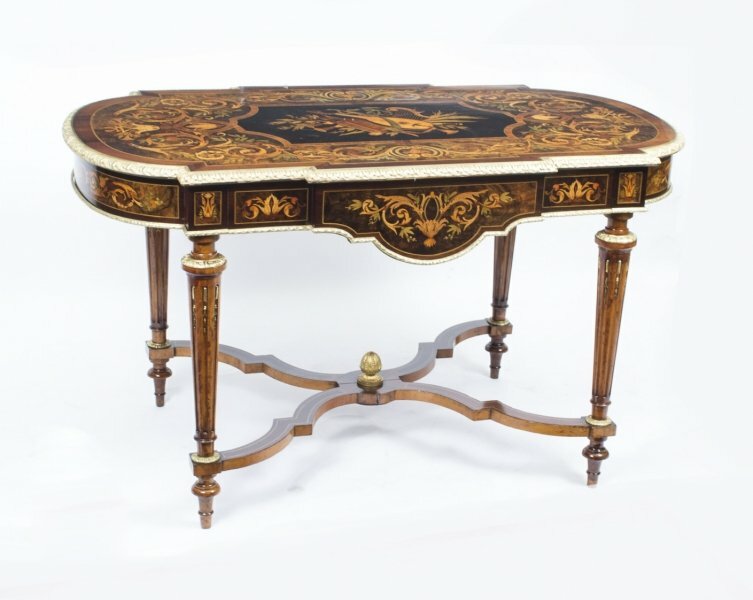 The lovely table top is supported by sturdy yet decorative turned and reeded legs which are joined by way of inlaid X-stretchers finished with a striking central ormolu mounted turned finial. 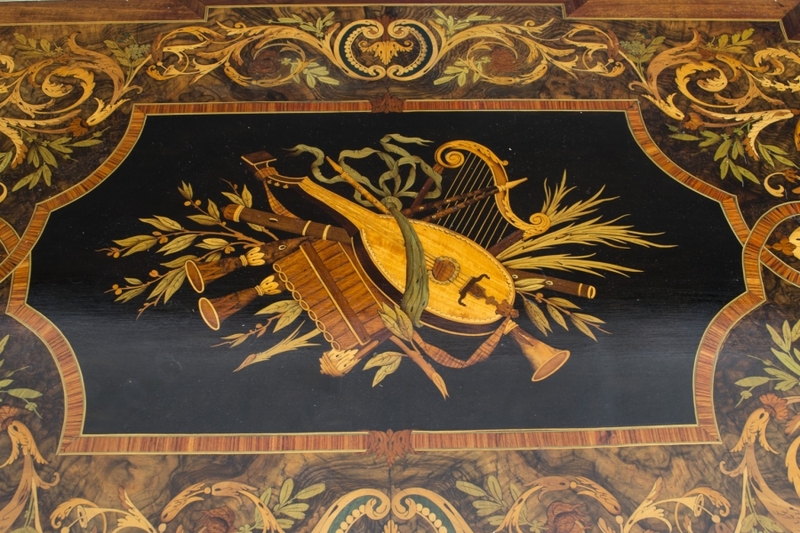 The table also features a good sized frieze drawer which is supplied complete with the original working lock and key. We offer this lovely bureau plat for sale in excellent condition as it has been fully and meticulously restored by our own craftsmen in our own workshops and to an exacting standard. 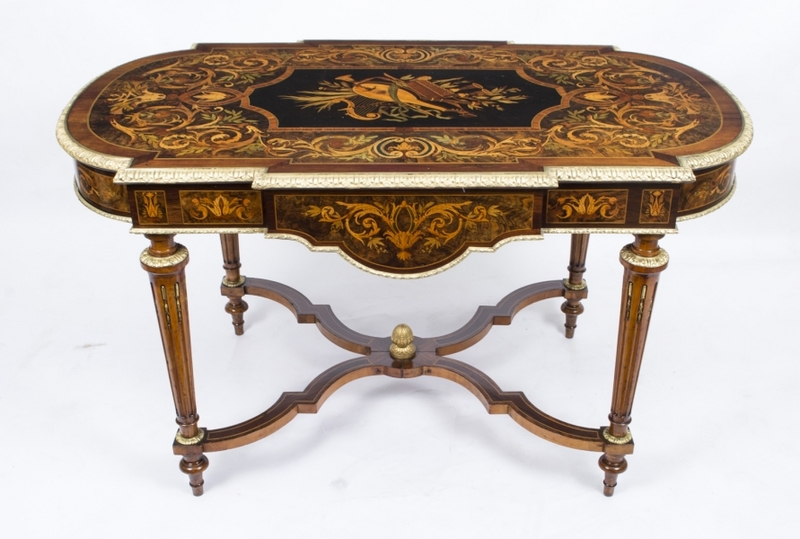 Offered for sale at only £5,250 this desk represents excellent value. 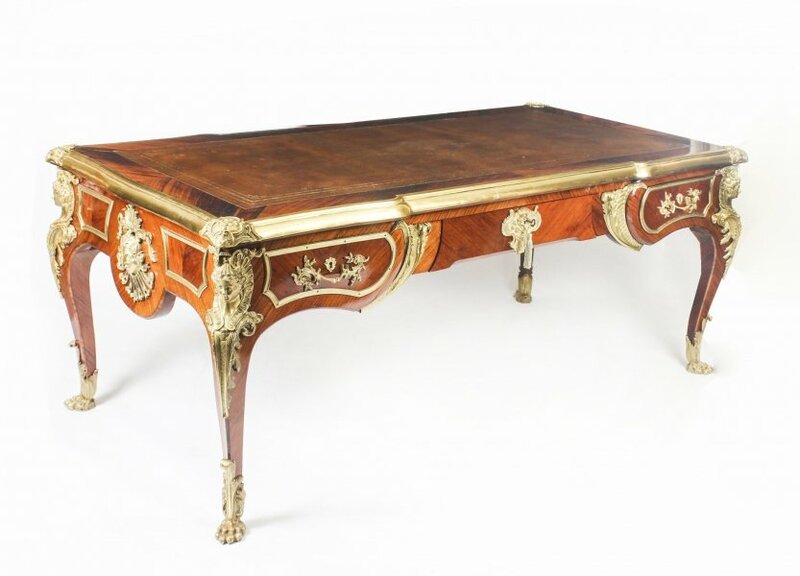 This desk is well proportioned and of a size that should make it suitable for placing in most rooms. The actual measurements are 74cm high x 129cm wide and 75cm deep. The equivalent in feet and inches would be 2 ft, 5 in high x 4 ft, 3 in wide and 2 ft, 5 in deep. 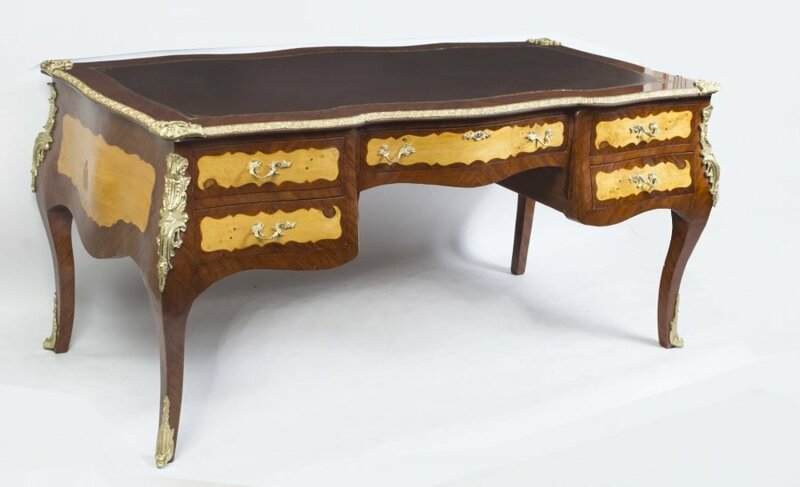 We are able to carefully pack and ship this wonderful desk to virtually any worldwide destination but if you are outside of mainland UK please request a shipping quotation before placing an order. 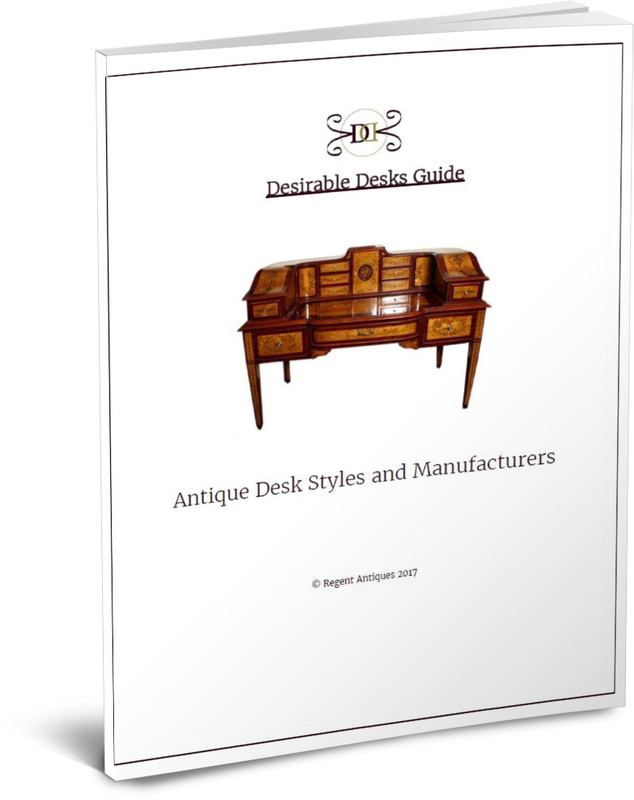 Our furniture experts are always on hand to advise on any aspect of this highly desirable desk. The number to call is: +44 20 8809 9605. UK mainland shipping is free of charge. 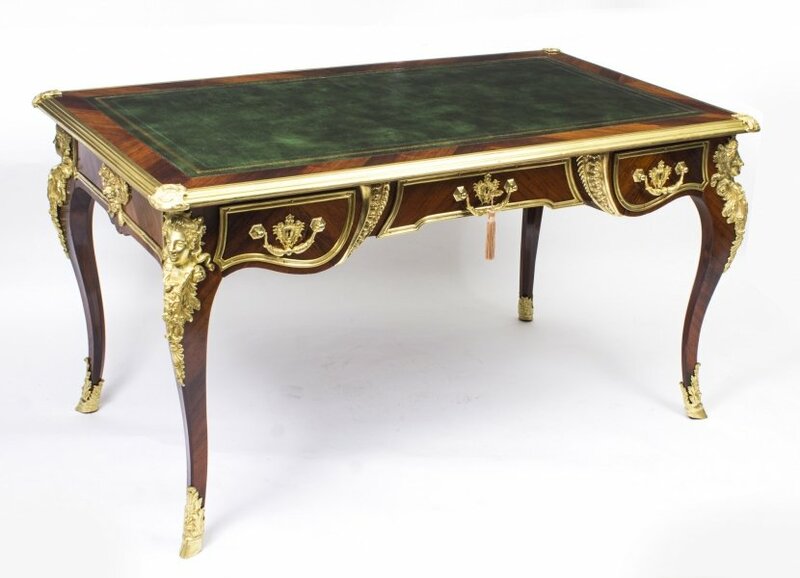 Our reference for this item is 07166 and we would ask you to quote this when contacting us in order to avoid confusion as we do offer a wide range of desks and bureau plat writing tables for sale.